Alex Rappaport is both an entrepreneur and a musician. He co-founded co-founded Flocabulary in 2004 and has been running the business ever since. As Flocabulary’s CEO, he has spoken on entrepreneurship and social enterprise for students and adults, and he presents regularly at national education conferences. Alex has a degree in music from Tufts University and currently lives in Brooklyn. Blake Harrison (pictured, left) is the creative director at Flocabulary. He co-founded Flocabulary with Alex after dreaming up the idea in high school. Having worked with students in many contexts, he now manages a roster of artists and educators to create award-winning educational content. Blake has been the keynote speaker at teacher conferences and high school graduations. He graduated from the University of Pennsylvania with a degree in English. Victor: Why did you create Flocabulary? Alex: Initially, we started writing songs because we wanted to make learning more fun and we saw an opportunity to use music to achieve that. Back in 2003, we had both just finished college ourselves and we remembered how tedious studying for the SAT had been. So we set out to make songs that would have helped us when we were students. As we started sharing the demo songs with teachers and students, the response was phenomenal. We’re still defined by that original idea of making learning fun, but the program has evolved to encompass a more ambitious goal—namely, to create resources that motivate, engage and teach students in a way that will impact the way they learn and achieve. As we like to say, a motivated student is a more successful student. 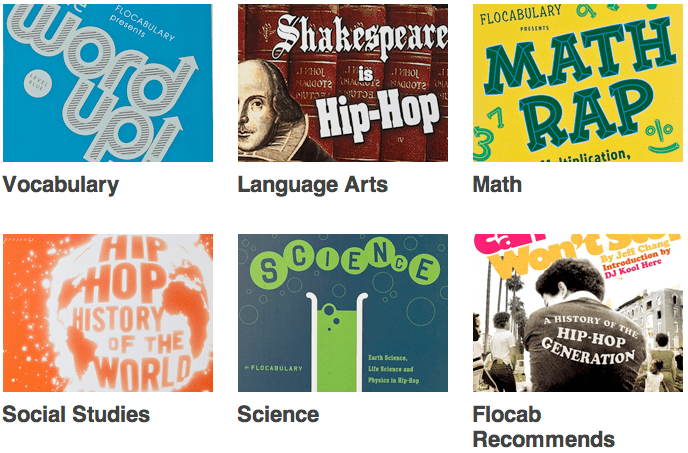 We created Flocabulary to foster a love of learning in students of all backgrounds. Alex: Flocabulary is the combination of Flow, meaning style or technique in the rap world, and Vocabulary. We named the program when we were working exclusively with SAT vocabulary, but the name stuck and has remained with us as we’ve branched out to other subjects. It continues to work because we believe that vocabulary is one of the most important building blocks of effective learning across the curriculum. Blake: I had the idea for Flocabulary when I was a student in high school. At the time I was struck by how easy it was to recall song lyrics and how hard was is to remember facts for tests. I was hoping someone would create a program that used everything I loved about rap music – catchy lyrics, humor, feel-good beats – to teach academic info. I mentioned this idea to Alex years later, and he said, “why not try it ourselves?” A few days later we recorded a demo and began sending it around. Since those first days of creating SAT vocabulary songs, we’ve branched out into numerous subject areas at different grade levels. Our current events series, The Week in Rap, now reaches a weekly audience of 5 million students and our print programs are used in over 15,000 schools. engagement that the songs and videos set in motion. The benefits of being engaged are obvious. A student learns at their full potential when they’re engaged and invested. But we have also seen broader benefits that extend into standardized testing. Students who used The Word Up Project for six months saw dramatic increases in their vocabulary proficiency and in their state test scores. Even more remarkable was the fact that we saw the most profound effects with low-income students. Alex: We feel as though we’re one of the most engaging programs out there for K-12 education. We place a lot of emphasis on producing music that kids (and teachers) will enjoy listening to. Humor is a big part of our approach to creating content, but we take our pedagogy seriously, too. I often like to say we’re the intersection of Isabel Beck and Jay-Z. Another one of our core beliefs is that a student is more willing to learn when she feels that her interests and passions are represented in the classroom. By utilizing hip-hop, we’re creating more common ground between academic content and the things kids love outside of school. Alex: We started making music in late 2003 and haven’t really slowed down since. The company has gone through many phases, from a consumer product in bookstores to a standards-based curricular program and now an online subscription. One thing that has worked well for us is staying light on our feet and not being afraid to change course when opportunities come up. We also made a point of growing organically so we didn’t lose a grip on the look and feel and sound of what we were doing. Blake: We’ve also had the chance to work with some amazingly talented people, including Grammy-winning producer 9th Wonder. He called us up one day and was so excited about our mission that he wanted to be a part of it. Coming from a guy who works with Jay-Z and Ludacris, that meant a lot to us. It’s a wonderful and surreal experience to work with some of your musical idols on a project that you consider your baby. Blake: As of this summer, you can access all of our content via a digital subscription on flocabulary.com. But it’s been a long road to get here. Alex: Our first product – a book and CD that taught 500 SAT words – was published for the retail market and was available on the shelves at Barnes and Noble, Borders, etc. After giving that a try for about a year, we came to the realization that the kids we wanted to reach with our music couldn’t necessarily afford to walk in to a bookstore and drop $18 on a learning product. So we made a shift in our strategy and started developing products for the classroom. This involved a catalog, sales reps, pilot programs, etc. It really changed our business, but all of a sudden we were able to reach thousands of kids by selling the program to the schools and districts. For a long time, schools could buy our books and CDs through our catalog and through distributors we worked with. The great thing about the new subscription program is that it’s even more affordable and utilizes classroom technology that is getting more popular every year. Blake: Digital subscriptions for teachers start at $5/month or $45/year. Educators and parents can add student access to their plans for a few dollars per student per year. We also offer site and district licenses with prices that vary somewhat with the size of the school or district, but that are competitive with with comparable programs. We also sell books and CDs in class sets and individually. Full pricing information is available here. Alex: We get dozens of emails from teachers every month and it’s one of the most rewarding parts of our job. We often hear that our songs and videos have revitalized teachers by giving them something they can use to reach a struggling student. We once heard that we restored a teacher’s faith in the profession. We hear from kids too. My favorite feedback is from kids who simply love to use Flocab words in their daily life. A student in Brooklyn once told me that he used to study in a perfunctory manner but that he started to love it after using Flocabulary. This was a kid who has behavioral problems and here he was dropping a million dollar vocab word off the cuff. Alex: Our content is for students of all backgrounds. Kids of all races and socio-economic levels are bored in school, so we’re making these resources for all of them. Anyone who’s ever thought something they learned could have been presented in a more interesting way. We really don’t want to limit who uses our product, but we’re not all that interested in convincing people who bring a prejudice about the strategy. Negative feedback is rare, but every now and then we get a nasty email from someone who thinks our approach is inappropriate. My response to the critics? Why don’t you come up with something to address the education crisis. It’s easy to stand on the sidelines and critique the people taking action. Blake: Exactly. We create our programs for anyone who likes music, humor and storytelling, and also needs to learn. The good news for our business is that 99 percent of students fit this criteria. Alex: I think the system is broken in a lot of ways. Kids are slipping through the cracks and ending on paths that have far-reaching consequences for our society, our economy. And while I admire the efforts of education reformers, I think they can focus on politics too much, often at the expense of the kids who are actually sitting between those classroom walls. I believe in quality teachers, small class sizes, access to enrichment, but I also believe that we should be presenting the content in an authentic, relevant, engaging way while we actually have the kids in the learning environment. That’s what Flocabulary is all about. There’s just no reason school has to be as boring and inaccessible as it is for a lot of these kids. We are creative people and we have a commitment to using our skills to make learning more effective for struggling students. If we can prevent kids from dropping out or foster a love of learning, our goals are being met. Blake: We’re all about raising test scores. And our programs do that. But fundamentally we need to be inspiring students to become life-long learners. And constantly cramming for tests doesn’t make anyone love learning. Victor: What sort of formative experiences in your own education helped to inform your approach to creating Flocabulary? Blake: In school, I loved debate and hated monotony. The lessons I remember most were the ones that connected to my own interests. Whenever a teacher would let me pick a topic of a paper or come up with ideas for a project, I would thrive. The best lessons and projects allow students to learn the standards, but also express their interests and voices. This is something that the best teachers know intuitively. And the worst teachers never learn. Alex: I think people are starting to wake up to the long term implications of the achievement gap and larger crisis we’re seeing in terms of test scores, dropout rates and a range of other issues. While I think we’re still figuring out what kinds of initiatives are having the biggest impact, I think there are some amazing programs that are getting traction. I’m definitely inspired by what Geoffrey Canada is trying to do at Harlem Children’s Zone and many of the charter school networks have the right ideas about helping at-risk kids achieve. I think it’s all about momentum and I’m starting to see the signs of a real movement in alternative education. Victor: What else can you tell educators and other leaders in and around education about the value of Flocabulary? Blake: Some educators will understand the value of Flocabulary off the bat. For the incredulous: pick one of our free songs and videos and play it for your students. Their reaction will be a better answer to this question than any I could give. I think flocabulary is the best learning resource for children to catch on to words that will advance them in english, writing, spelling and just giving them a challenge period. I absolutely love it. I homeschool myi kids using flocabulary they instantly fell in love with it. My daughter started using it when she was ten years old and was challenging adults making them feel some kind of way. I dont stop referring your product to people. Keep doin what you do.